Very Good. A New York Times best-selling call to arms from Nobel Prize-winning economist Paul Krugman. Num Pages: 288 pages, illustrations. BIC Classification: KCX. Category: (P) Professional & Vocational. Dimension: 211 x 140 x 18. Weight in Grams: 242. 8vo. Good clean copy. 2013. 1st Edition. Paperback.....We ship daily from our Bookshop. Very Good. 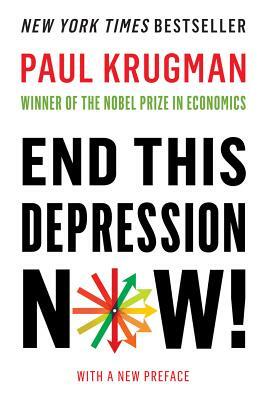 A New York Times best-selling call to arms from Nobel Prize-winning economist Paul Krugman. Trade paperback (US). Glued binding. 288 p. Contains: Illustrations. Good. A New York Times best-selling call to arms from Nobel Prize-winning economist Paul Krugman. Trade paperback (US). Glued binding. 288 p. Contains: Illustrations. All Editions of End This Depression Now! Sound advice for an unsound economy. Mr. Krugman offers sound advice on our unsound economy. This is a book that offers the kind of solutions that have worked in the past and would work again if only we implemented them. The kind of solutions that are intentionally not being discussed in the national discourse because it flies in the face of the special interests of the 1%, who are profiting handsomely to the detriment of everyone else. This is the kind of book that wades through the intentional confusion that has become our present day economy and puts into laymans terms solutions that we know will work. Mr. Krugman tells us what our present day robber barons don't want us to know. If you want real answers to our economic problems, read this book. Its contents are what the 1% don't want you to understand.